The inscription indicates that the propriety of the villa was a component of Gens Volusia. The villa was the residence of Rectina, the friend and lover of Plinio il Vecchio, who as a result of these close affiliations to Plinio, was saved in 79 A.D. while in Pompeii during the eruption of Mt. Vesuvius. 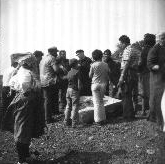 To confirm this event and furthermore, the presence of Rectina in Casalpiano, is an Ara Votiva (votive altar) on which there is an inscription made by the ex-slave Eutichus (Fortunato) dedicating it to the lares as an ex voto (an object dedicated to a god) on the occasion of the return of Lady Rectina. In Ancient Rome lares were deified spirits of ancestors (similar to guardian spirits) that watched over the houses of their descendants. C. SALVIUS EUTICHUS LARIBUS CASANICIS OB REDITUM RECTINAE NOSTRAE VOTUM SOLVIT. In this villa (up until the point of the completion of its excavations) worked 200 to 300 slaves that were adept in agricultural work and the fabrication of oil lamps. The villa was most likely inhabited until the 5th century A.D. 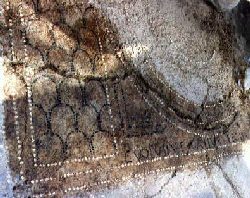 There are different inscriptions found on the site at Casalpiano, all a confirmation, however, of its once Roman presence. The stele stands with its sides only briefly outlined. It is surmounted by a spandrel inset with two beasts facing each other. In the carved and stripe-framed rectangular space below, four half-busts are displayed. All the figures have their right arm folded over their chest. Their facial features are not meticulously rendered but nevertheless, they represent distinct portraits: the eyes, upon looking more closely, are characterized only by a carving of an eyelid, the mouth is tight-lipped, and the ears are big and detached. The two external figures (feminine looking and with raised hairstyles) are depicted in tunics where folds form a cross in the center; the two central figures (more masculine looking) wear togas. One is wearing a toga that has a flat collar while the other character has flowing locks dangling onto his forehead and his folded arm is covered by a balteus, a type of roman scabbard. The folds are rendered flatly and are and hardened with symmetrical grooves. The artisanal relief is done rustically and is very similar to many other pieces from the immediate region, which most are now found in the Museum of Isernia. 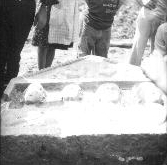 This stele was recovered in 1979 in the locality of Serre in a field while it was being plowed.